4.1 Why does Hawaii have Interstates? 4.2 What's the story with Interstate H-201? 4.3 What's this I hear about a curse on Interstate H-3? 4.4 Was the new Hawaii Superferry part of the Interstate highway system? 4.5 Are, or were, there plans for an Interstate H-4, or other new Interstates or freeways in Hawaii? 4.6 Do Hawaii's Interstate route numbers have a hyphen between the "H" and the number? 4.7 Are Hawaii's Interstates ever referred to as "I-H-1," etc.? Even though Hawaii is separated by thousands of miles of ocean from any other state, there is nothing unusual about having Interstates on Oahu. The "Interstate" system is really the National System of Interstate and Defense Highways, intended to serve military needs as well as civilian interstate traffic. And Oahu certainly has military needs in abundance. Be not deceived by the sensuously swaying hips of the wahine dancing for the sightseers! Behind the touristy facade, Oahu is a fortress island, bearing one of the heaviest concentrations of military forces on this planet. The Interstate highway network on Oahu also meets the great and often overwhelming needs of local and tourist civilian traffic, as one would expect for a city and metropolitan area the size of Honolulu's (population of over 370,000 in the city proper, plus about another 500,000 on the rest of Oahu, not counting the multitude of tourists and other visitors there at any given time). In any event, there is no requirement that "Interstate" routes cross state lines. Most 3-digit Interstate routes on the mainland are entirely in one state, as indeed are many 1- or 2-digit "mainline" Interstate routes (such as I-4 in Florida, I-12 and I-49 in Louisiana, and I-27, I-37, and I-45 in Texas). The Interstate system was originally limited by law to the contiguous 48 states. In 1959, the year Congress authorized Hawaii's admission to statehood, it also removed the 48-state limitation on the Interstate system, and called for a study of whether Hawaii (and the other new state, Alaska) should get new Interstates. Hawaii (but not Alaska) got the nod the following year, and on August 29, 1960 Interstates H-1, H-2, and H-3 were approved for addition to the Interstate system. As discussed in the following item, three decades later Hawaii picked up a fourth Interstate (though until recently hardly anybody there knew it). FHWA's website also covers this subject: "Ask the Rambler: Interstates in Hawaii: ARE WE CRAZY???". Interstate H-201 was long a little-known "secret" Interstate designation for part of Moanalua Freeway west of downtown Honolulu. The secret's now out, with Interstate shields starting to show up on the freeway in July 2004. The Interstate includes most of the Moanalua Freeway, between Interstate H-1 exit 13 near Aloha Stadium and H-1 exit 19 west of downtown Honolulu. It excludes the stub of the freeway west of H-1 exit 13, which remained and is signed as state route 78. While H-201 became an Interstate in 1989, for almost 15 years that remained a "secret" designation, little-known except to the Federal Highway Administration, Hawaii DOT, and "roads scholars." That part of the Moanalua Freeway until recently remained signed as part of state route 78, with no visible indication of the H-201 designation. Now, as discussed below, the signage is being brought into line with the formal Interstate designation. The Federal Highway Administration approved the addition of the Moanalua Freeway, between H-1 exit 13 and H-1 exit 19, to the Interstate system on November 1, 1989. The freeway was designated as a "non-chargeable" Interstate pursuant to (since-repealed) U.S. Code title 23, section 139(a). Such designation authorized Hawaii DOT to place Interstate shields on the route, but did not create any increased entitlement to Federal aid for route improvements or maintenance. 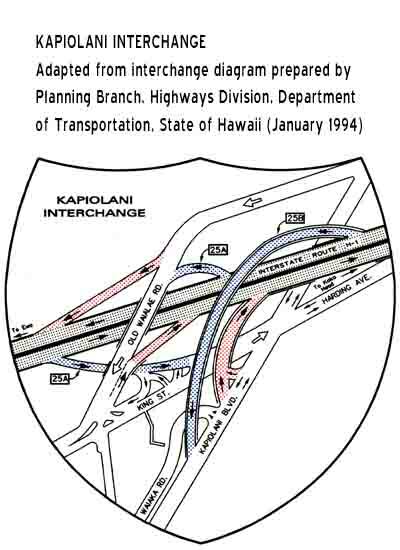 However, when FHWA approved redesignation of the Moanalua Freeway as an Interstate, it noted that the above junction did not conform to Interstate design standards, and any future improvements would need either to correct the design deficiencies or receive Federal approval to leave them uncorrected [i.e., simply renumbering the highway would not by itself correct the "nonconforming condition"]. FHWA emphasized that the redesignation would not obligate the Federal Government to help pay for correction of the deficiencies, any more than it would if the new Interstate had been left as a Federal-aid primary state route. 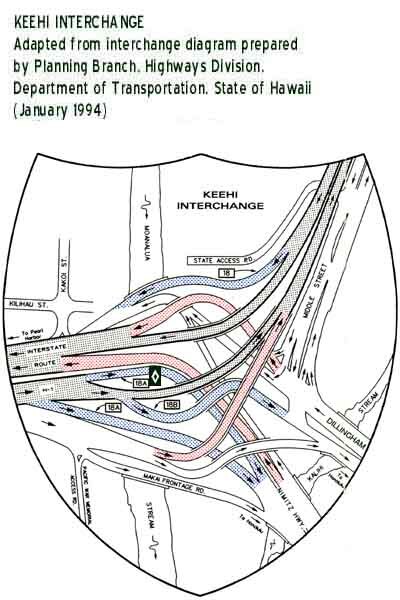 To this day, the above junction remains rather awkward, requiring westbound travelers to slow down and move into the two right lanes for a (posted) 35 mph exit in order to stay on H-1, while Moanalua Freeway-bound traffic zips by with a higher speed limit in the three left lanes. FHWA at first provisionally designated the Moanalua Freeway as Interstate H-1A. However, the American Association of State Highway and Transportation Officials (which must sign off on Interstate route numberings) objected in June 1990, in view of its policy against letter suffixes for Interstate route numbers, and suggested a 3-digit number assignment instead. Hawaii DOT came back with a request for H-101. AASHTO felt that since the route was a "loop" rather than a "spur," its number should begin with an even rather than an odd digit. With FHWA's concurrence, AASHTO approved an amended designation of the Moanalua Freeway as Interstate H-201, in December 1990. See the minutes of AASHTO's June and December 1990 committee meetings where the new Interstate number for the Moanalua Freeway was decided. c. Keeping the new number "secret"
According to Mr. Iwasa, "our current Interstate signs cannot accommodate the 'H-201' in a size that would be easily legible to the motoring public. In addition, Oahu road maps show Moanalua Road [now Moanalua Freeway] as being route 78 and it was felt that making the change would confuse the public." According to Earl Kobatake, then also with Hawaii DOT, another reason for Hawaii DOT's keeping H-201 an unsigned Interstate was to encourage tourists to use the newer and better-designed Interstate H-1. More recently, Hawaii DOT spokesman Scott Ishikawa explained that there was also concern about motorist confusion between Interstate H-201 and the unrelated Interstate H-2 a few miles away. 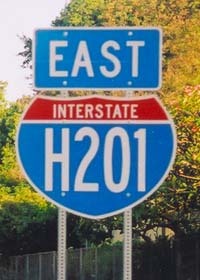 In 2004, Hawaii DOT finally started to bring the route signage on Interstate H-201 into line with its official designation. (In mid-2003, in advance of the changeover, some road atlases misidentified the Moanalua Freeway as state route H201, apparently based on a map on Hawaii DOT's website which made the same error.) The re-signing was done in connection with a major resurfacing of both sides of the freeway, which required nighttime closures over several days for the side of the freeway being redone. Hawaii DOT figured that would be a good time to change the aging overhead signs, and believed that the new signs ought to show the official Interstate route number rather than the old state route number. The new Interstate shields started showing up on the eastbound lanes in mid-July 2004, when resurfacing of that side of the freeway was completed. They replace the old state route 78 markers on the signs where they appear. When all is done (don't know if the re-signings are completed -- they weren't as of January 2009 -- or when they will be), the re-signed freeway will have only Interstate route markers, and not the old state route markers, between its two junctions with Interstate H-1. See this close-up photo of a new H-201 reassurance marker (right), as well as the Other Freeways photos page (covering Interstate H-2 as well as the Moanalua Freeway) for some other photos of new H-201 shields. Their "bubble" shield style (also used in some places on the mainland) and skinny characters, as well as omission of the hyphen in the route number (standard for on-freeway Interstate signs in Hawaii), help fit the route number on the Interstate shield. However, the number is still not nearly as legible as on Hawaii's other Interstates, which have only two-character route numbers. Ah, yes, the famous H-3 "hewa" (pronounced "heva"), said by some native Hawaiians to explain some odd and otherwise inexplicable incidents during the construction of H-3 through the Halawa Valley (to which they objected because of the valley's religious and cultural significance), which fortunately caused only property damage and no injuries or fatalities. However, as far as I know, the "hewa" is not an issue for travelers now that the freeway is open. For more details, see the brief discussion on this topic near the end of the Interstate H-3 road photos page. 4.4 Was the Hawaii Superferry part of the Interstate highway system? No. The old logo for the former Hawaii Superferry interisland auto ferry system did look rather like an Interstate H-4 shield, as if the ferries would be an extension of the Interstate highway network on Oahu to reach several of Hawaii's other major islands. However, the shield was not quite the same as a regular Interstate shield (for example, "Interstate" was replaced with "Interisland", and "Hawaii Superferry" appeared in place of the state name). Moreover, the ferry system was privately-owned and operated, rather than part of the highway network maintained by Hawaii DOT's Highways Division (though its Harbors Division provided dock facilities for the ferry vessels). A more detailed Hawaii Superferry discussion appears later in these FAQs. 4.5 Are, or were, there plans for an Interstate H-4, or other new Interstates or other freeways in Hawaii? There are no current plans for any new Interstates, or for that matter any other freeways, anywhere in Hawaii. There are long-range possibilities for new freeways (probably non-Interstate), on Oahu and elsewhere, but they are speculative, do not have any kind of official approval even as preliminary plans, and are at least a decade or two away from construction even if they are ever approved. There have been long-abandoned proposals for additional Interstates, mainly on Oahu. When Alaska and Hawaii were admitted to statehood, Congress ordered a study of whether the new states should get Interstate highways. Hawaii DOT proposed Interstate upgrades to just about every primary state highway on Oahu, even the Farrington Highway around Kaena Point in northwest Oahu (once a legendarily bad unpaved road, now permanently closed despite the absence of any decent alternate route between the west and north coasts), as well as an Interstate between the Big Island's deep draft harbors in Hilo and Kawaihae. The proposed Kaena Point freeway is sometimes thought to have been a proposed Interstate H-4, but as far as I can tell the unsuccessful proposal never was given that route number. The U.S. Bureau of Public Roads recommended approval (which was later granted, on August 29, 1960) for the Interstate corridors on Oahu which ultimately were assigned route numbers H-1, H-2, and H-3. (H-3 was later rerouted from the Moanalua Valley as originally planned, west to the adjacent Halawa Valley, but the 1960 approval for the H-3 corridor was general enough to allow Hawaii DOT to move H-3 over by one valley.) The runner-up proposal that just missed the cutoff was an eastward extension of what is now H-1 to Koko Head. Near the bottom of the rankings was the proposed "H-4" freeway around Kaena Point (but that still was less of a flop than Alaska's proposed Interstate to Nome). See U.S. Department of Commerce, Bureau of Public Roads, "Report on Extension of National System of Interstate and Defense Highways Within Alaska and Hawaii" (January 1960) (9.48 MB download, requires Adobe Reader). My review of historical Hawaii DOT planning documents confirms that Hawaii DOT generally did not further pursue the planned Interstates that were rejected by the Bureau of Public Roads in 1960. That includes in particular the proposed Interstate around Kaena Point, which Hawaii DOT plans quickly downgraded to a proposed two-lane parkway, before it completely fell off Hawaii DOT's radar screen. Something kind of like the original proposed extension of Interstate H-1 east to Koko Head was pursued by Hawaii DOT up to at least 1980, specifically a controversial proposed rerouting of about eight miles of the Kalanianaole Highway (state route 72) inland north of Koko Head. However, that proposal may have been for only a divided highway, not an Interstate or other freeway. In 1968, Hawaii DOT proposed adding a new 6.5 mile-long Interstate H-4 through downtown Honolulu (report 3.14 MB downland, requires Adobe Reader), though the proposal appears to have gone nowhere in a hurry. The new freeway would have run east from Interstate H-1 exit 18 (the Keehi Interchange east of the airport), over a long viaduct following Dillingham Boulevard, the Nimitz Highway and Ala Moana Boulevard along the Honolulu waterfront, then continuing east (perhaps at ground level rather than on a viaduct) past the Ala Moana Shopping Center before turning inland west of Waikiki to rejoin Interstate H-1 at exit 25 (the Kapiolani Interchange north of Waikiki). Hawaii DOT considered but rejected for cost reasons an alternative putting part of H-4 in an underwater tunnel offshore. The H-4 proposal apparently was made in a bid for some of the additional Interstate system mileage and funding authorized by Congress in 1968, and I suspect the proposal simply lost out to competing mainland projects. However, local opposition to an elevated waterfront freeway may also have discouraged Hawaii DOT from proceeding with the project, with less favorable funding, as a non-Interstate highway. In any event, the 1968 H-4 proposal went unmentioned in Hawaii DOT annual reports for later years, though it was at least nominally alive in 1970, showing up in a Federal report on outstanding Interstate system extension requests. Also in the late 1960s, Hawaii DOT suggested an offshore "reef highway", to relieve already-building traffic congestion in eastern Honolulu, as an alternative to unpopular proposals to improve Interstate H-1 and state route 72 (including an unspecified elevated freeway through downtown Honolulu, perhaps the H-4 proposal discussed above). The reef highway would have been on causeways linking a series of artificial islands built atop reefs, from near Honolulu Harbor past Waikiki to near Koko Head. This proposal, however, immediately met strong public opposition and was not pursued. The proposal for the "reef highway" appears never to have been developed enough to be formally adopted by Hawaii DOT. Kurumi's proposal to replace the curvaceous Hana Highway in east Maui with a six-lane Interstate H-4 freeway was, of course, made purely in jest ("if my conscience ever evaporates," he emphasizes). Also, as noted in item 4.4 above, the former Hawaii Superferry interisland auto ferry system for a time used a pseudo-Interstate H-4 logo. The system later used a more straightforward and consumer-friendly logo, featuring manta rays. Officially, the Interstate route numbers are hyphenated (H-1, H-2, etc.). The hyphen is almost always omitted from the route shields on the freeways themselves, permitting a sleek design with large numbers. However, some of the newer signs on local streets, directing traffic onto Interstate entrances, and also a half-dozen signs erected since 2002 showing the new names adopted that year for several Hawaii Interstates, include the hyphen in the route number (as well as the state name, which is omitted from standard on-freeway route shields -- as if anybody ever needed a reminder that they were still in Hawaii!). See the Introduction page to the Hawaii Highways road photos collection for examples. The hyphenated Interstate route numbers are rather awkward in some ways -- for example, something like "Interstates H-1-H-3" is a more confusing reference to consecutive routes than "Interstates H1-H3" -- and the "H1, "H2" and "H3" shields look nicer and are much easier to read from a distance than shields with the hyphen. Perhaps influenced by Hawaii's experience, when Alaska was allowed in 1980 to designate (purely on paper) four Interstates of its own, their route numbers were at least initially left unhyphenated: "A1," "A2," etc. But formally de-hyphenating Hawaii's Interstates would throw them out of synch with the rest of the Interstate numbering system (see next item), and in any event wouldn't be worth the trouble. Thankfully, no. They're simply called "H-1," etc. or "Interstate H-1," etc. In addition to looking strange with the Hawaii Interstates' "H-" numbers, the "I-" prefix would be inappropriate because FHWA reserves that for the mainland's Interstate network, and assigns instead the distinctive "H-" prefix to the separate Hawaii Interstate network. Thus, the FHWA route log refers to "I-4," "I-5," etc., but to the Hawaii Interstates as "H-1," "H-2," etc., with the "H-" substituted for "I-" as the prefix. Ditto for the "paper" Interstates of Alaska and Puerto Rico, which are respectively "A-1," etc. and "PRI-1," etc., with no "I-" (pre-)prefix. Comments, more questions, etc.? Please e-mail me. © Oscar Voss. Last updated March 2013.